“Where did this bread come from?” asked a guest at our dinner table. “It’s delicious.” To that question, there is a very short answer. But there is also a longer answer that goes to the heart of Buddhist meditative practice. 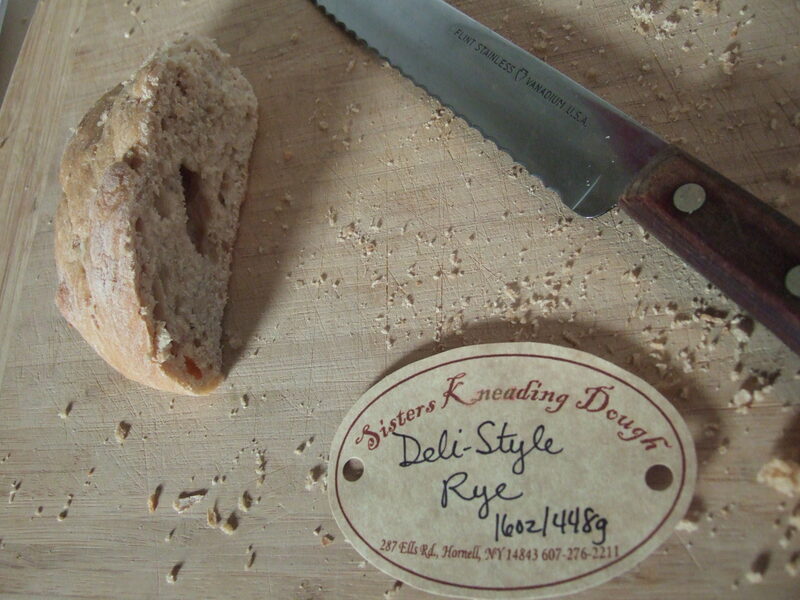 The short answer is that the Deli-Style Rye we were enjoying came from Sisters Kneading Dough, a home bakery in Almond, New York. Every Friday afternoon, the sisters Beth and Jayne arrive at Quest Farm with their trays of bread and muffins, still warm from the oven. On that particular Friday, my wife, Robin, and I also arrived, and we came home with the Deli-Style Rye, along with a loaf of Robin’s favorite, Cinnamon Swirl. That, in short, is where the bread on our table came from. The longer answer is that the bread came from sources too numerous to mention. Deli-Style Rye is made from organic bread flour (wheat and barley), whole wheat flour, water, whole rye flour, caraway seeds, honey, yeast, and canola oil. And each of these ingredients has a history of its own. Without the work of the bees and their keepers, there would have been no honey. Without sunlight, water, earth, and the labors of the farmers, distributors, truckers, and the rest, there would have been no flour, yeast, or canola oil. Without our driving to Quest Farm on a Friday afternoon, the Deli-style Rye would never have reached our home. Like anything else that we might conventionally regard as a single thing, the bread on our table was an aggregate of countless, interconnected things, without which it could not have come into being. And as its quick disappearance demonstrated, it was not really a solid object but a transitory node in the web of life, an event in a never-ending process. As Zen master Thich Nhat Hanh observes, these simple sentences state the “Buddhist genesis,”* and the main tenets of Buddhist thought, including the doctrines of impermanence and emptiness, flow from this primary source. Beyond its philosophical import, the principle of dependent origination also helps to explain the nature of conditioned suffering. And in at least three ways, a clear understanding of this ancient principle can relieve the anxiety endemic to Western culture. It’s a little bit like a snowstorm—the coming together of a certain temperature, a certain amount of precipitation, a certain amount of wind co-creating a snow storm. Or it’s like the writing of a book: one needs an idea, one needs a pen, one needs paper, one needs the ability to write. It’s not necessarily true that first I must have this and then I must have this in a certain sequential order, but rather that the coming together of certain causes and conditions allows this particular phenomenon or this particular experience to be born. To be sure, the recognition that one’s physical or emotional suffering has multiple causes can engender frustration, particularly if those causes are not self-evident. To unearth and address them might require the assistance of a therapist or health professional. But even without knowing specific causes or conditions, we can experience the second benefit of understanding dependent origination, namely the recognition that our conditioned suffering is not a permanent thing. It had a beginning, and it may well have an end. For anyone in serious physical or emotional trouble, the sentence, “This ceases to be, because that ceases to be” can be more than a succinct description of the laws of reality. It can come as a timely reassurance, if not a life-preserving revelation. To say as much, however, is not to imply that those who are in difficulty need only wait until conditions change in their favor. For if the first benefit of understanding dependent origination is the recognition of multiple causation, and the second a renewed acknowledgement of impermanence, the third is the realization that we ourselves are links in the causal chain. Stopping to look into that chain, we can see how our present state of mind, be it anger or sorrow or elation, arose from concrete causes and conditions. We can see that our present state of mind is itself becoming a cause, creating future conditions for ourselves and others. And over time we can learn to act—or refrain from acting—in accordance with those insights.